The original list, “10 cooking staples that can outlast you“, was written by Laura Moss. It’s great info for anyone stocking up on food and would make a good addition to your Survival Mom Binder. The original list follows with my comments in italics. growth. 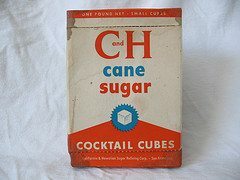 The challenge with sugar is to keep it from hardening into chunks. To keep sugar fresh, store it in an airtight container or seal it in a plastic bag. If your brown sugar is more like a brown rock, you can revive it with just a minute in the microwave on low heat. If you don’t use sugar very often, store it in canning jars and even sealed, small mylar bags. The price of sugar has been rising, so now would be a good time to stock up on at least 40 pounds, which is the recommended amount for one person for one year. If you’re planning on making preserves, you’ll need a lot more. Pure vanilla extract – If you have pure vanilla extract in the back of the cupboard, there’s no need to throw it out because it lasts forever. It may be more expensive than its imitation counterpart, but its shelf life certainly outweighs the extra cost. Keep that vanilla flavor at its best by sealing the bottle after each use and storing it in a cool, dark place. If you buy extracts for storage purposes, they should all last at least four years if stored in a dark, cool place. Most contain an amount of ethyl alcohol, which has preservative elements and lasts for years. Rice – White, wild, jasmine, arborio and basmati rice all keep forever so there’s no need to throw them out. Brown rice is the one exception because it has a higher oil content so store it in the refrigerator or freeze it to maximize its shelf life. Once you’ve opened a bag or box of rice, move it to an airtight container or resealable freezer bag to keep it fresh. You simply can’t go wrong by stocking up on plenty of rice. It’s a meal-stretcher and can be prepared in so many different ways that it’s one of my favorite food-storage basics. Save up 2-liter soda bottles, clean them and let them air dry for super storage containers for your rice. Honey – Whether you use it in your tea, on your toast or as an alternative sweetener, that jar of pure honey is good forever. It may get grainy or change color, but it’s still safe to eat — and delicious — because its antibiotic properties keep it from spoiling. You can help keep it fresh by storing it in a cool area, and you can improve the quality of crystallized honey by placing the jar in warm water and stirring it until the grainy parts dissolve. Before pulling out the Neosporin or some other antibacterial ointment, try dabbing a little honey on scratches, scrapes, and bug bites. Do a little research on the benefits of honey, other than as a sweetener, and you’ll want to stock up on a whole lot more of this sweet stuff! 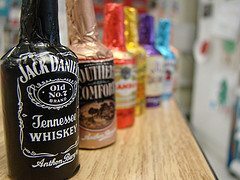 Hard liquor – Mixing drinks at your holiday party? There’s no need to replace those decades-old bottles of gin and whisky. Distilled spirits like vodka, rum, whisky, tequila and gin don’t ever spoil — even after opening. The taste, color or aroma may fade over time, but it’ll hardly be noticeable. Keep the bottles tightly closed and store them in a cool area away from direct heat or sunlight. Plenty of preppers talk of making their own stills and having alcohol on hand as an item for barter. It’s good to know that those little airplane-size bottles you buy of vodka, rum, or whatever will last a very, very long time, and historically, bottles of alcoholic beverages have always been popular for trade and barter. Salt – The contents of your salt shaker will never spoil, regardless of whether it’s basic table salt or sea salt. Simply store it in a cool, dry place and salt will keep indefinitely. Try Celtic Sea Salt for a healthy version of salt and remember to stock up on about 5 pounds of salt per person. It’s main enemy is moisture, so make sure it’s stored off the ground, away from outside walls, and if possible, in glass jars or commercially sealed cans. Corn syrup – If you come across a years-old bottle of corn syrup in your pantry, don’t throw it out. This sweetener keeps indefinitely as long as you keep it sealed and store it in a cool, dry area. It’s good to know that the bottle of corn syrup I’ve had for at least five years is perfectly fine! You can always make your own , another good reason for stocking up on plenty of sugar. 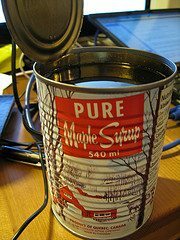 Maple syrup - What good are pancakes or waffles without maple syrup? Luckily, this flavorful syrup will never spoil if you refrigerate it or freeze it. For long-term storage, seal it in an airtight plastic container and freeze it. “The freezer is such a useful tool that can really save you money because there are very few foods that don’t freeze well,” says Janice Revell of Still Tasty. Except that where food storage is concerned, the freezer is only a back-up since it’s so vulnerable to power outages and even something as simple as someone leaving the door open. It’s possible to make your ownmaple syrup. If your family enjoys pancake, French toast, and waffle breakfasts, you’d better have plenty of syrup on hand or a few maple trees out in the backyard! Distilled white vinegar – This wonder product can be used for everything, from making marinades and salad dressings to cleaning house and doing laundry. But the best thing about distilled white vinegar is that it lasts for years. Simply close it tightly after each use and store the bottle in a cool, dark place. My own recipe for a multi-purpose cleaner is simply equal parts vinegar and water. I use it for just about everything. The LDS Food Calculator suggests just a half gallon per person per year, but I recommend much more in order to take advantage of its many uses. © 2011, thesurvivalmom. All rights reserved.